Bo playing "Where's Elmo?" Can you find Bo in this picture? 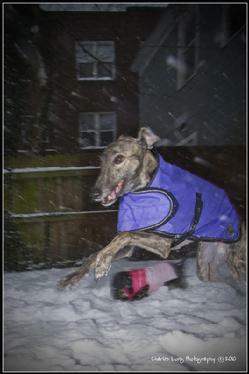 Bo makes his own race track in the snow! 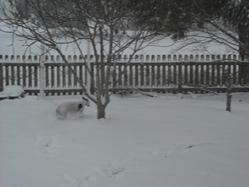 Bo playing "hide and seek"
Chance and Cali finally decide "hey this snow stuff isn't so bad after all!" 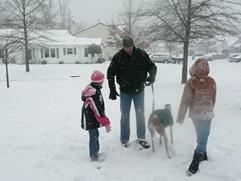 Comet checks out the snow with Daniel and the girls. 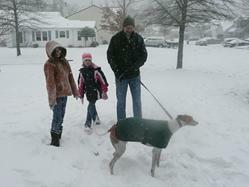 Comet, Daniel and the girls. 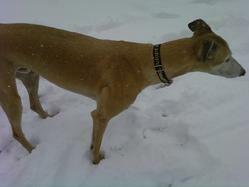 Donnie says "Hey, I'm not so sure about this." "Nope, not really liking this at all." "Help! I want to go back inside!" 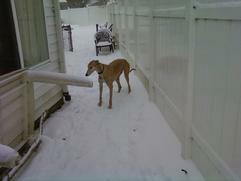 Elgin is staying warm while enjoying the white stuff. 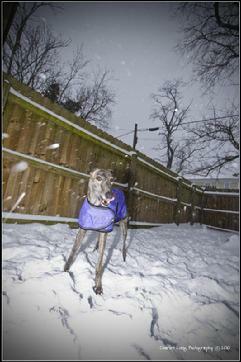 Lily takes off to do zoomies in the snow. Lily sure does have a big grin on her face! 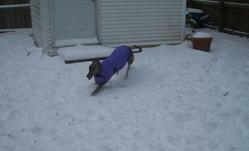 Lily does a final zoomie in the yard before going inside to warm up and take a nap. 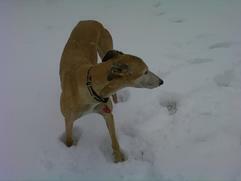 Molliegh enjoys an early morning romp in the snow. Elgin, GinnyK, Eli and Vinny the iggy romp and play. 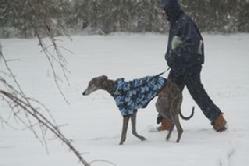 Walker stays warm in his coat while he and Mary stoll out to check the mail. Gracie says: "Hey Mom! 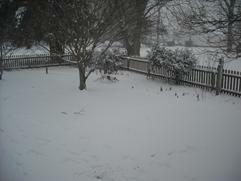 Where's the grass?" "Seriously, it was just here the other day." "And I REALLY have to go potty." "Hey, I think I smell something that could be grass under here!" "Ahhh, never found the grass but when a girl's got to go....."
No polar plunge for Blue! 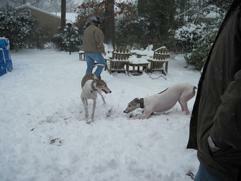 Tori and Lizzie enjoy the snow. 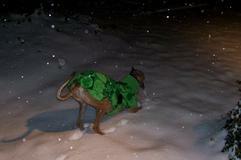 Roarke models his new coat made just in time for the snow storm. Annabelle gets set to do a zoomie in the yard. 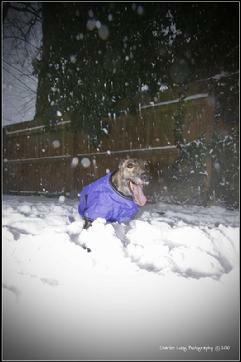 Annabelle takes off through the snow. 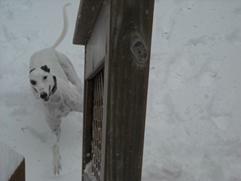 Annabelle rounds the far turn and heads for home! And Annabelle is back for another run.